I love music and have loads of collection on my iPod that 80 gb is falling short of. Be it a sufi, a classical, an instrumental, I have myriad genres of music stored on my iPod. Without music, I wonder how life would exist on earth. I am sure everyone of us, listen to radio, at least while commuting in the bus or train. Some are also inspired to sing or learn a musical instrument though we are not trained. Well, speaking of singers or musicians who are self-trained, Kishore da is my favourite. I am happy to watch this video featuring Usman Riaz, a self taught musician, and his thirst to learn a variety of musical instruments, all by himself listening to the hundreds and hundreds of audios on internet. When I listened to his compositions, I was totally mesmerized and started to search for some more compositions by him. He comes from a family of artists and musicians. 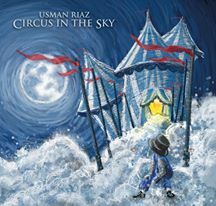 Usman started playing classical piano at the age of six and taught himself to play a variety of instruments from the internet. When people say, they download and learn to play the guitar seeing the youtube videos, it still takes me to surprise, how! Unlike, other areas of learning, music needs a lot of dedication and concentration. I, myself, having learned basics of Carnatic music, find it very hard to follow the musical notes on the internet and request my teacher to correct me when I play out of tune. I confess, two of the western musical instruments I own, both Piccolo, a western classical flute and keyboard, I have failed to play with without flaws and a Tanvajur Veena. But this video talk by Usman is truly an inspiring one. He explains how he had to pause, to get the exact finger position. At sixteen, he played a guitar. He used the knowledge acquired to make his own music, orchestras, paintings and relate them. This does not limit him to compositions, but goes a step ahead body percussion and making films. He shares his experience of traveling across the globe, one among the 32 musicians in the US and his happiest moment of sharing the stage with his internet Guru from whom he learn to pluck the guitar strings. Usman has set an example on how people can make use of the internet in a good way, by learning most toughest things at ease. This video is a source of inspiration to those who complain, that they couldn't find a teacher! Check Usman's webpage: http://www.usmanriaz.me and get lost in music.Who knows, you would start playing some tunes on your abandoned guitar seeing this video. For now, I am dusting my long forgotten instruments and searching for online lessons. This post was written in association with Indiblogger for IDEA Caravan by Franklin Templeton Investment which partnered the TEDxGateway. That's why he stands out, he never quit. He believed in his ability. Hope you can also achieve the same with your instruments.